Austin Perkins, a California native, is a climbing diehard and now oversees climbers and teaches indoor climbing lessons at the University of Wisconsin - Eau Claire. When we think about rock climbing, places like Yosemite or the Rocky Mountains come to mind. Serious climbers don’t waste their time dawdling in the Midwest, right? Of course, California and Colorado are a haven for high-grade climbs, but opportunities for aspiring ascenders in Wisconsin and Minnesota trail close behind. Just ask Austin Perkins. After growing up in Berkley, Calif., he followed his father and younger brother to UW-Eau Claire. Perkins became a climbing die-hard after attending a summer climbing camp in California at 15. He began working at the camp shortly thereafter and made a living teaching at a local climbing gym post-high school. Determined to continue building his eight years of experience on Wisconsin soil, Perkins sought a climbing community at UWEC. His search led him to Al Wiberg, program director at the university’s Environmental Adventure Center (EAC). 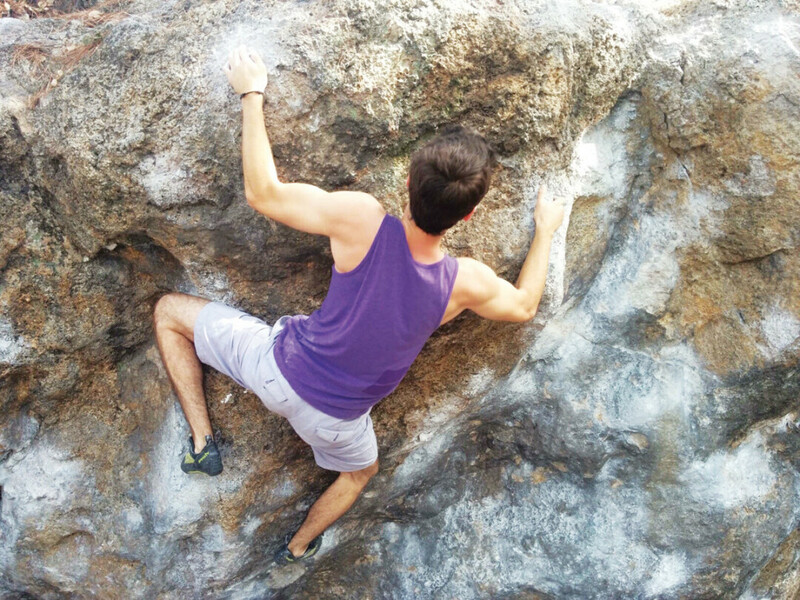 Upon discovering the center’s indoor climbing wall and a vibrant group of student climbers, he applied for a job. Despite Wiberg’s reluctance to hire an experienced climber – he prefers people who are new to the sport so he can teach proper techniques to blank slates – Perkins won him over. Perkins works as a wall staff, overseeing climbers and teaching indoor climbing classes. Despite his extensive experience, he had to earn his climbing wall instructor certification – one of many certificates Wiberg is qualified to distribute – to teach at the EAC. Now, he’s working toward certifications in outdoor guiding and the EAC’s ropes course. He also teaches route setting to his co-workers, a new realm of climbing in which Perkins has unique experience. 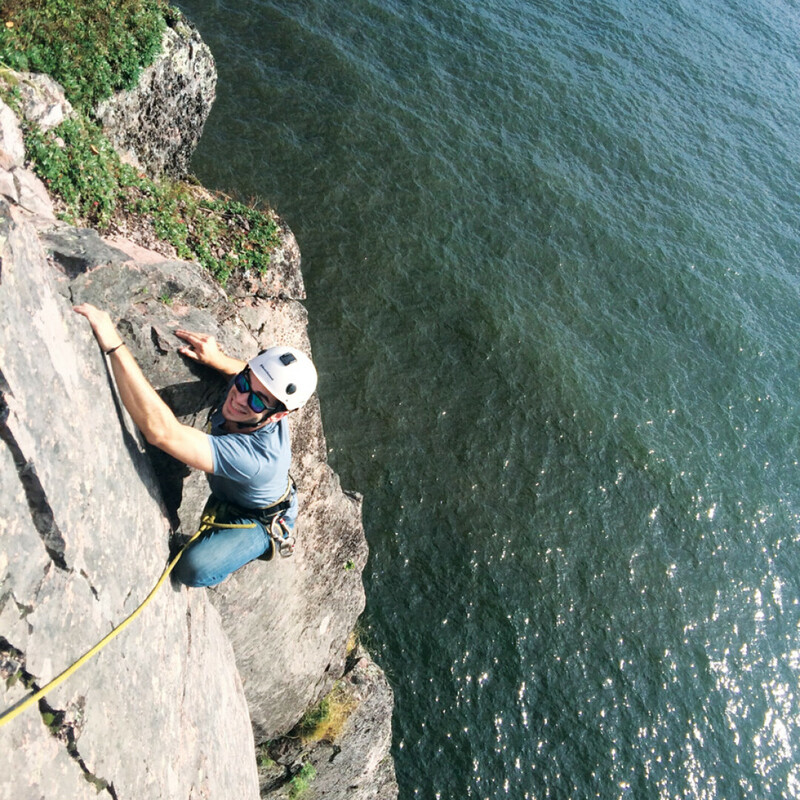 When he’s not on the job, Perkins explores rock climbing in Wisconsin and surrounding states. Rock wall enthusiasts at the EAC took him in with open arms, resolving to show him the best climbing spots – indoors and out – in the area. Though he’s lived in Eau Claire for less than a year, he’s more familiar with the regional topography than most Wisconsinites. Along the way, he was introduced to the Eau Climbers, Eau Claire’s unofficial climbing team. Each year, the Eau Climbers compete in WICS, a circuit of competitions at university climbing gyms across the state. At the end of the season, scores are tallied from each competition. The top individuals and teams earn a prize. One UWEC climber took third this year, and Perkins aims to up the Eau Climbers’ competitive edge. Though he’s not big on competition, Perkins loves mentoring. He plans to use his experience and teaching skills to unite the Eau Climbers. Team t-shirts and group coaching sessions are in the works, and he hopes to implement his plans next season. As Perkins soon found, the EAC is not limited to regional rock climbing. The center offers low-cost day, weekend, and spring break trips for students centered on everything from mountain biking to backpacking to – of course – climbing. They rent outdoor equipment, fix bikes, and offer adventurous activities like indoor archery and ropes courses. The best part? Many of the EAC’s amenities – including the climbing wall, ropes course, and equipment rental – are available to community members of all ages. 3. Vertical Endeavors, Minneapolis, St. Paul, and Bloomington, Minn.
3. Interstate State Park, Taylor’s Falls, Minn.
4. Tettegouche State Park, North Shore, Minn.
1. Wear clothes you’re comfortable moving in. Ripping your skinny jeans is the last thing you want to happen 30 feet in the air. 2. Climbing shoes feel small by design. For your first time, find a comfortable pair and stick with them. You’ll acclimate to tighter shoes as you gain experience. 3. Be prepared to nurse your forearms. Climbing is a much harder workout than people expect, notes Perkins. You will be sore the next day. 4. Be social. If you want to get into climbing, seek out your local climbing community. Climbers love it when new people get into the sport. Chances are, they’ll be happy to help you along. 5. Don’t let YouTube be your teacher. Instead, find a mentor. It’s much better – not to mention safer – to learn from an experienced climber than a computer screen.